It’s beginning to look a lot like Christmas! We actually had a little snow on outside this morning when we woke up. Today I need to get some running around done. At least I finally got my Christmas cards finished and mailed yesterday. Trying to get some of the cards I made ‘early’ posted on my blog before the holiday os over! This was a card I made for the December Creative Crew on SCS. The challenge was to incorporate newsprint/book print in your card. The base of the card is Riding Hood Red, I took a piece of the First Edition, stamped the outline poinsettia in Basic Black and the more solid image in Riding Hood Red. I layered this on Basic Black then to the card front. Next I took a piece of Lucky Limeade, cut into a banner, ran it through the Delicate Designs Embossing Folder, added a piece of Champagne Glimmer paper then added to the card front. 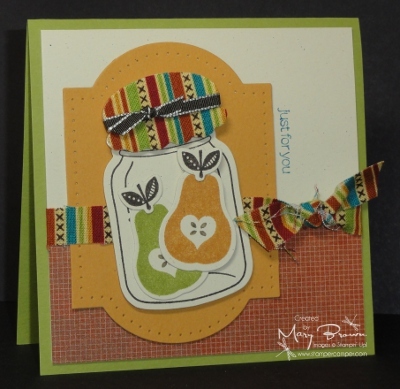 I stamped the greeting in Lucky Limeade, punched with the Decorative Label punch and added to the card front using dimensionals. I stamped an additional flower on the newsprint – I did one in Riding Hood Red and one in Lucky Limeade (for the leaves), cute them out and layered onto the card front using dimensionals. I finished it off by coloring some Basic Pearls with the Gold Glimmer pen and adding to the center of the poinsettia. Gee…what will I post once Christmas is over? Oh…that’s right…NEW STUFF!!! The base of the card is Whisper White. I took another piece of Whisper White and pierced two ornaments on there (okay…you might need to click on the picture to see this a little easier! It does look cool!) Any way, I used the ornament framelits to cut an ornament out of red glimmer paper, punch a 1 1/4″ silver glimmer scallop circle then stamped the Merry Christmas in Versamark, silver embossed, punched with 3/4″ Circle Punch and added using a dimensional. The ornament is added to the panel using dimensionals. I made a ‘bow’ (click tutorial link above to access this) using Whisper White Organza Ribbon and a Silver Glimmer Brad and added to the panel. The panel is added to the card front using dimensionals. Okay…so I was needing to make a card for my November Creative Crew assignment on SCS to use the colors in the Festive dsp pack and I wanted a unique layout for the card. Then I was looking at Mary Jo’s Technostamper Monday Lunchtime Sketch Challenge and thought I like the overall look but was going to take a couple ‘liberties’ with her sketch. You know…that’s the nice thing about sketch challenges, they can be a place to start! This is such an easy card. The base of the card is Very Vanilla. I took strips of dsp from the Festive dsp paper pack and cut the in ends into different banners and added to the card front. Next I took a piece of watercolor paper, stamped the Frosty Friends in versamark and embossed with the Early Espresso Embossing Powder and colored in with my Island Indigo (no … really …it’s in there… it’s the birds), Cherry Cobbler, Lucky Limeade and Crumb Cake markers, layered a Cherry Cobbler Large Scallop Edge under it, a Cherry Cobbler strip on the top and then wrapped a piece of Lucky Limeade Ruffled Ribbon around it. This is added to the card front. I stamped the greeting using Lucky Limeade and Cherry Cobbler markers on Very Vanilla, punched with the Large Oval Punch, layered onto an Early Espresso Scallop Oval Punch piece then added to the card front using dimensionals. I stamped the little tree from the Merry Minis using Lucky Limeade and Early Espresso, punched with the Merry Mini Tree Punch and added using a dimensional. Now if you would like to see all the ‘Creative Crew’ creations for November, check them out here. 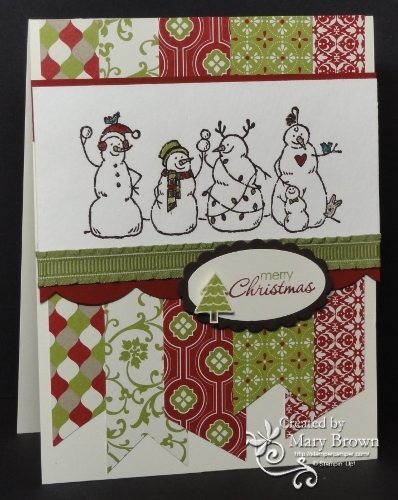 Frosty Friends is such a great little stamp! Do you want some GREAT ideas for holiday and winter cards that you can’t see anywhere else? 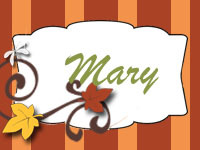 Then check out Create with Connie and Mary Card “Create”tions. Click on the badge on the right to learn more! Happy Halloween everyone! 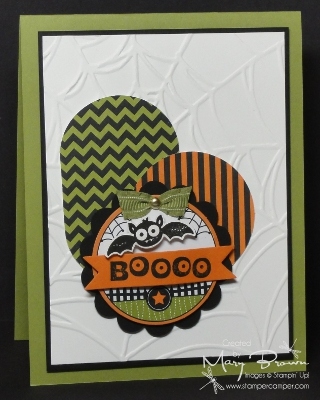 Just wanted to share a cute little card I made for the October Creative Crew on Splitcoast Stampers. I’m just showing my ‘stepped up’ version as I thought it turned out soooo cute! The base of the card is Lucky Limeade. I too a piece of Whisper White, ran it through the Web Embossing Folder, layered it onto Basic Black then to the card front using dimensionals. I took the oval and circle labels from the Ghoulish Ghouls Designer Kit, turned them over to use the backside and added to the card front. I took another circle label, colored the edge in Pumpkin Pie, layered onto a 2 3/8″ Basic Black Scallop, added a piece of Lucky Limeade Ruffled Ribbon to a Gold Brad then to the label and added to the card front using dimensionals. I stamped Boooo on Pumpkin Pie, cut with Bitty Banners then added to the card front. Finally I stamped the bat using Basic Black on Whisper White, cute out and added using dimensionals. I MEANT to add some googlie eyes but forgot before taking my pictures. This is my very favorite way to use this stamp – emboss resist! This card is really easy to make…the base of the card is Very Vanilla and I ran it through the Woodgrain Embossing Folder. Next I took another piece of Very Vanilla and did the piercing with a combination of the Festive Template the straight line. 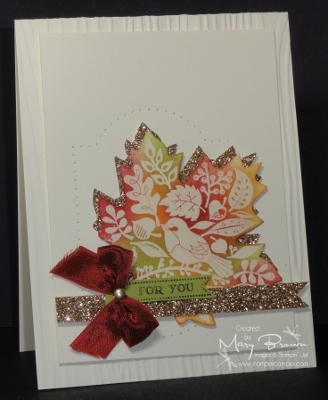 I stamped cut out a Very Vanilla leaf using the Autumn Accents Die, stamped using Versamark and embossed in clear. I sponged Cherry Cobbler, More Mustard and Lucky Limeade on it, layered it onto a Champagne Glitter leaf and added to the panel. I took a piece of the Champagne Glitter paper and added to the panel. I stamped the for you using Early Espresso on Lucky Limeade, cut with the Bitty Banner Framelit, added a ‘bow’ (click here for my tutorial) from Cherry Cobbler Seam Binding and a gold Brad, then added the panel to the card base using dimensionals. I just love how these pretty colors just ‘pop’ on the Very Vanilla! 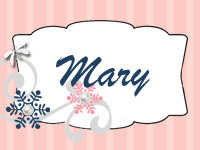 I am part of the ‘Creative Crew” for Stampin’ Up! demos over on Splitcoaststampers. Every month we have a series of challenges and this month it was fall and sewing. This is one of the projects I made for it and it is perfect to talk about Fall on Create with Connie and Mary Holiday Edition too! The base of the card is Lucky Limeade. I took a piece of Natural Cream and added a piece of the Cajun Craze dsp on the bottom. Next I made the label by altering one of the window label cut out pieces, piecing around the inside and adding the panel. I took a strip of fabric and used it as my ‘ribbon’ by tying it around the panel then adding this to the card base using dimensionals. I stamped the jar using Early Espresso on Very Vanilla and used the Cannery Framelits to cut it out. I made the lid by add some fabric to cardstock then using the framelit on that. I added a piece of Early Espresso 1/8″ Taffeta ribbon than added the lid using dimensionals. I did the pair in Lucky Limeade, More Mustard and Early Espresso, cut out with the framelits then added inside the jar. The greeting was stamped using Pacific Point.